An artist's impression of the new museum on the proposed site in Helsinki's South Harbor. 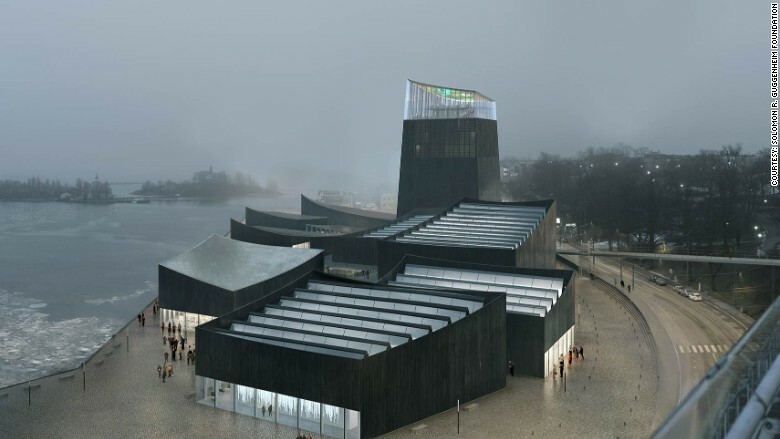 Finland has given the thumbs down to plans for a new Guggenheim museum in its capital city. Helsinki city council rejected a plan to build the museum, saying the project was too expensive. Finland is still struggling with the aftermath of the global financial crisis. Left-wing politicians said the cost to taxpayers was too high at a time of austerity. The Nordic country was in recession for three straight years between 2012 and 2014, and has barely grown since. Finnish GDP will grow by less than 1% this year, according to the International Monetary Fund. The cost to build the Guggenheim art museum was estimated at 130 million euros ($138 million), with the city expected to pay 80 million euros ($85 million) from its own budget. Running the museum once open would have cost the city around 6.5 million euros ($6.9 million) per year, the council said. The Finnish government said in September that it would not fund the museum, leaving it up to the city to pick up the bill. But the city council voted 53-32 against the proposal late on Wednesday. Richard Armstrong, the Solomon R. Guggenheim Foundation director, said he was disappointed with the decision. The New York based Guggenheim has two sister museums abroad, in Bilbao and Venice, and a third is planned for Abu Dhabi. The foundation first pitched the idea of a museum in Helsinki in 2011, but the proposal was voted down by the local government. The foundation then came up with a new financing plan and held a design competition last year. The winning design -- a collection of linked pavilions with wavy roofs -- was submitted by French architect agency Moreau Kusunoki Architectes.